31-year old female in Edmond, Oklahoma, United States. Is america more violent today than in the past? Why or why not. What makes americans believe that there is more violence? Crime rates are decreasing . . . My guess is that more crime is being reported. It is easier to track crime now than it was in the past since the system is more centralized and the advent of computers has made information storage easier. Crime rate decreasing is being debated. It's not more reporting, it's usually considered the end of the crack-cocaine epidemic, demographic changes, and higher arrest/conviction rates. CCW laws might have had an effect, too. The crack-cocaine epidemic ended over 10 years ago. Demographic changes contribute very little to crime and quantity of police contribute very little to crime rates. Furthermore, most of the people getting locked up now are non-violent drug users. The crack epidemic may be over but we still have REEFER MADNESS to justify filling up our prisons. Or atleast the government wants us to think so, what with bullsh!t like "The pot they have today is 5 times more dangerous and unpredictable than the pot that your parents smoked in the 1970s. This pot is all mean and aggressive and not mellow at all. And it's more dangerous than cigarettes! Why? Because it's not grown organically!" 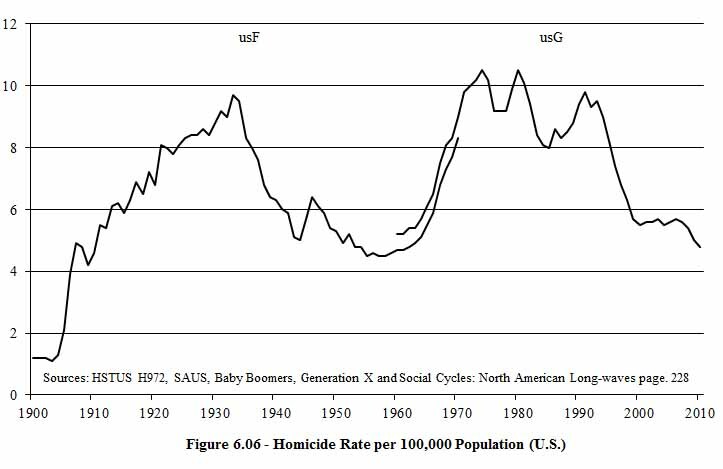 Homicide rates has increased since 1900s rates, but has been decreasing since the 1960s. b) abortions have decreased crime since many of the "undesirables" get pre-eliminated. While rates of domestic terrorism are increasing... I have heard of at least four shootings there in like the past month. I think that the massive amount of shooting sprees in the country this year has just been a random spike in violence. There's not really anything to suggest that there is going to be a maintained rise in violence at this point. Free countries will always be violent. Maybe free countries are not so good then. Maybe a little violence is not so bad then.